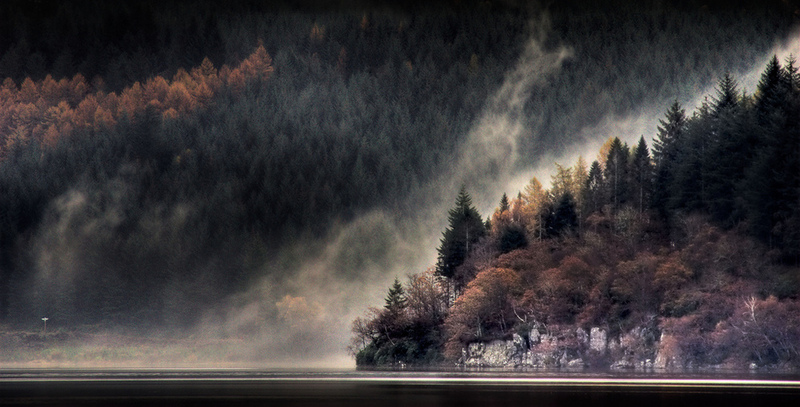 Photographers guide to Loch Ard. A loch in the Trossachs district of Stirling Council Area, Loch Ard lies to the north of Loch Ard Forest, 3 miles (5 km) west of Aberfoyle. The loch is in three parts which are joined by beautiful waterways. This small part of the loch is popular with photographers due, I feel, to its ability to hold on to early morning mist longer than most surrounding areas, as it is a valley and closely penned in by the trees on either side, that, and the very picturesque jetty and boathouse, this is the first stop for most snappers on there journey up the loch...Parking is scarce, so I would suggest you park in the carpark at the forest park area and walk the few hundred yards to this spot. ...again very widely photographed and readily accessible, commanding views down the Loch west towards Ben Lomond.this area is particularly beautiful in Autumn when the trees are in full colour and the rising sun providing spectacular options. 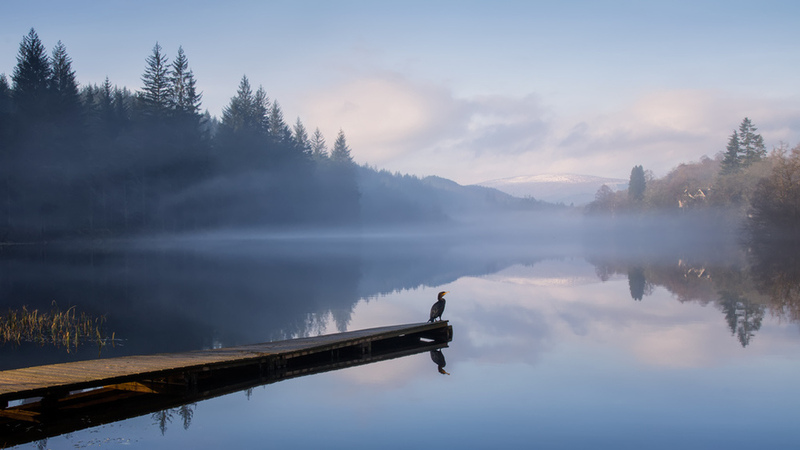 The Light through the mist at this part of the loch is particularly exquisite, coming from the east and rising over the forest to illuminate this stunning area of the loch.. Looking west at the same time of day will give you , on a good morning a spectacular view of Ben Lomond in the distance over the end of the loch at Kinlochard. A few hundred yards after the resort is a car park which is the main one for those who take to walking up Ben Venue and the surrounding hills, and the base for the fishermen who fish for large pike on the Loch, in front of the Ledard Farm entrance, is a field usually home to several species of geese as well as horses and sheep... please respect the Scottish Outdoor Access Code when using these areas as the environment around here is sensitive. The tree line in this field in front of the farm is an excellent area to shoot both east and west as well as spectacular panoramas across the Loch..
Ledard Farm field looking West. Kinlochard marks the end of the loch, but does not fail to deliver in its views back east down the loch , and becomes the starting point for many who explore the Loch Ard forest trails on the south side of the Loch, with ample parking and well signed tracks. To see locations, car parks and additional information click on the google map below. Click the map to follow the link..
A tripod for long exposures and sharp shots, and preferably a water resistant camera! Midge repellant (essential after May, sometimes a head net) see midge forecast . For comprehensive information on access and activities in this area check out the Forestry Commission website I hope this guide has been useful... If you have any questions or wish to comment, please contact me.